To be highly productive and to be able to focus are essential if you want to be and stay successful in today’s workplace. However, the human brain tolerates only a certain amount of stress before it’s performance starts to decrease. When exposed to high levels of stress over several years, the symptoms associated with the aging process may become stronger. Symptoms include weaker concentration, poor memory and brain fog. Especially in people over 40, these symptoms are common, even more so when they (or someone else) demand high performance from themselves and their brains over a period of several years. Fortunately, there are scientifically proven remedies that not only counteract this stress, but effectively treat the symptoms and significantly slow down the brain’s aging process so you can increase and maintain your performance and combat stress. All of them have been carefully selected and assembled for you in BrainTonus Nootropics. Nootropics are specific nutrients that stimulate the brain’s metabolism and help the brain and its nerve cells to regenerate faster. These nutrients are substances that can’t be produced by the body itself and cause the release of certain neurotransmitters that provide more energy and improve the ability to focus (e.g., dopamine and acetylcholine). Experience has shown that the effect of these nootropics increase when they are carefully combined and selected. Science has identified 5 nootropics that significantly improve performance, slow down the brain’s aging process and allow the brain to deliver higher levels of performance more often. Especially for performance-oriented executives between the ages of 40 and 55, these natural remedies can impact performance and long-term health positively. 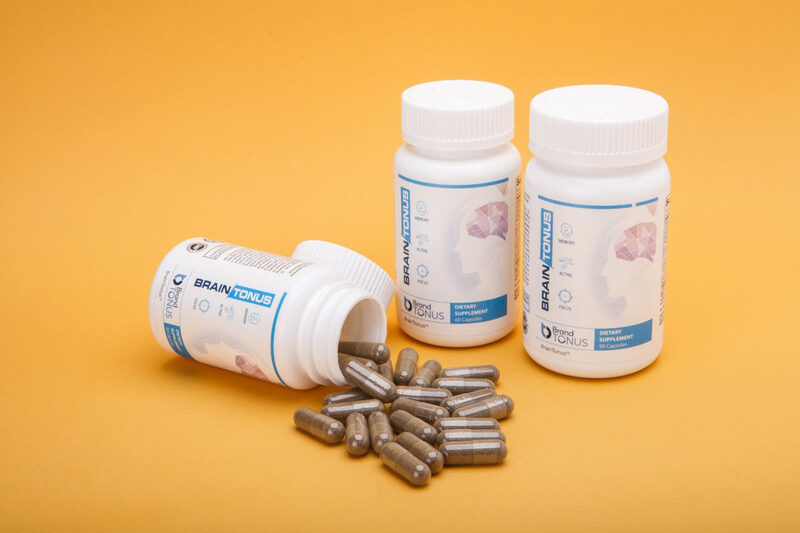 The five ingredients of BrainTonus Nootropics are Gingko biloba leaf, Huperzene A, N-Acetyl L Carnitine HCI, St. John’s Wort and Bacopa monnieri leaf extract. The Gingko Biloba tree is the last survivor of its family (Ginkgophyta). The first plants of its kind existed 175-200 million years ago. Gingko is consumed with its leaves and seeds in East Asia and in traditional Chinese medicine, it has a reputation for, among other things, significantly improving cognitive abilities and counteracting brain diseases such as dementia or Alzheimer’s disease. A meta-analysis from 2013 confirms that Gingko works against and may prevent dementia among other things and suggests that many other, sometimes far less serious diseases of the brain can be treated with it . Another study from China shows that Gingko has greatly improved the recovery of cognitive abilities in people who have had a stroke. Huperzene-A is a substance that occurs in the clubmoss family (huperzia selago, huperzia serrata). It reversibly inhibits acetylcholinesterase, thereby maintaining a certain acetylcholine level. Acetylcholine is the neurotransmitter responsible for focus and mental stamina. In addition to the effects on focus and mental clarity, studies also show that Huperzene-A may have a positive effect on the course of Alzheimer’s disease . Acetyl-L-carnitine HCL is essentially an amino acid that contains acetate and L-carnitine. It is produced in the body to some extent by the conversion of L-carnitine and lysine in the liver. Once absorbed into the bloodstream, it is used by the cells to produce fuel for energy. According to the University of Maryland Medical Center, N-Acetly L-Carnitine HCI has been proven to help cure angina and has a preventive effect on various heart diseases. N-Acetly L-Carnitine HCI is a true all-rounder and is also used for many other conditions such as AIDS, down syndrome, poor circulation in the brain, cataracts and nerve pain due to diabetes. St. John’s Wort is native to Europe, West Asia and North Africa, has been used for centuries in natural medicine and is known primarily as a mood enhancer. Several studies show that taking St. John’s Wort has a positive effect on depression, elevates mood and improves brain function . In addition to depression, St. John’s Wort also has a positive impact on stress resistance, anxiety, pain relief, strengthens the immune system and aids emotional stability . Bacopa monnieri is the best-studied nootropic and is made out of the Brahmi plant. Brahmi is a species that is subordinate to the genus Bold (Bacopa), and belongs to the family of plantain plants. It has been used in Ayurvedic medicine for over 3,000 years, and has been used mainly for the treatment of epilepsy and asthma. It was named after the Indian god “Brahma“. Although Bacopa Monnieri is still largely unknown in Europe, its profile is increasing, probably because of its positive effect on thinking and learning . The ingredients of BrainTonus Nootropics are not just selected anecdotally, but backed by science. Although the ingredients are similar in their individual effects, they also complement each other and thus provide optimal nutrient supply to your brain to perform at higher levels and to slow down its aging process. Gingko’s unique ability to drive brain regeneration meets the acetylcholinesterase-inhibiting effect of Huperzene-A, which in addition to the benefits of N-acetyl L carnitine HCI and Bacopa monnieri leaf extract leads to a higher release of the neurotransmitter for mental power: acetylcholine. St. John’s Word adds extra brain energy, reduces the effects of stress, brightens your mood and aids emotional stability.